You can also donate by text, cheque, BACS or online..
Cheques should be payable to: "Tree of Hope". Please make sure that: Lewis Herbert - (Life for Lewis - Campaign 2) is written on the back of your cheque. For online donations please visit the Life for Lewis Tree of Hope web page. Note: Online donations are processed on the Tree of Hope's JustGiving web page. 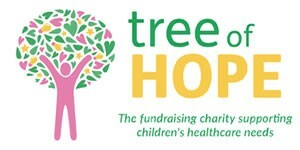 Why we use Tree of Hope to administer our fundraising activities..
Tree of Hope is the crowdfunding charity that helps children and young people with a disability or illness by supporting their families to raise the money they need to pay for specialist care that is not freely available through the UK healthcare system. It is not possible for a charity to be established to support an individual child. However, Tree of Hope is the umbrella charity which has supported thousands of individual children’s campaigns for almost 25 years.